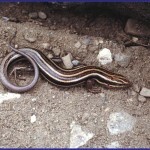 Five-lined Skinks are Ontario’s only lizard. 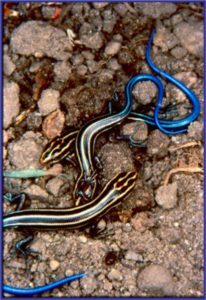 Young are black with five creamy or yellowish stripes running from the head down the back, and have a bright blue tail. Young can be as small as 4 to 6 cm (2 in.). As they age the background colour dulls to brown or grey and the lines to beige. Adults can reach up to 20 cm (8 in.). Adult males will have a reddish orange snout and jaws. 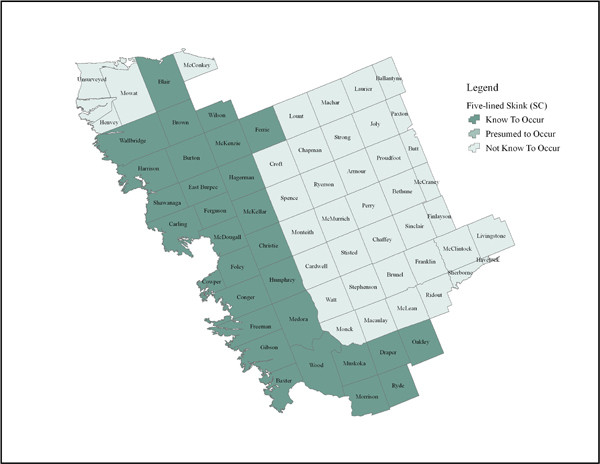 Rocky areas where cracks offer shelter and nesting sites, open wooded areas with ground cover (leaf litter, rotting logs, rocks and brush piles) and areas of sandy soils. Insects, spiders, worms and snails. Over-winter in old mammal burrows, rotting logs, and piles of vegetation from October to April or May often in small groups. 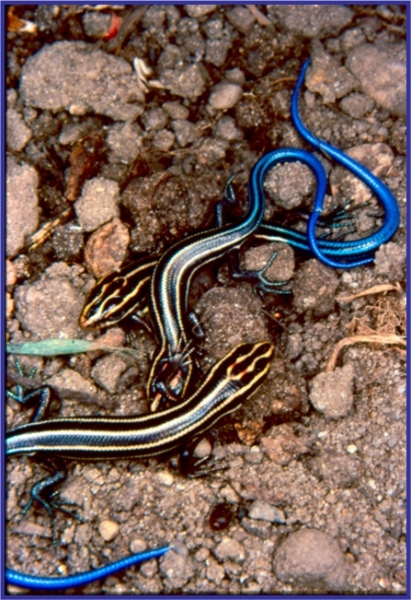 If a predator grabs a skink by the tail, the tail will disconnect from the skink’s body at weak points along the vertebrate. 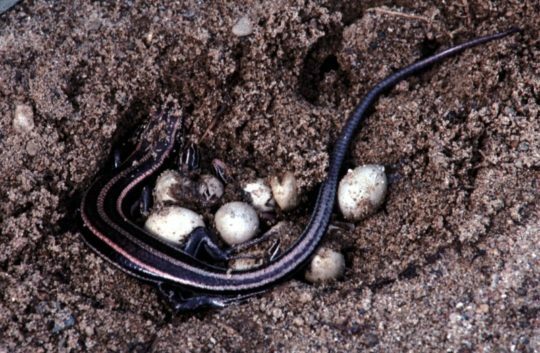 The tail will flop on the ground, distracting the predator as the skink finds shelter beneath a shrub or rock. Males defend territory during breeding season. Females lay an average of 9 eggs about one month after mating within rotting logs or under rocks. Female will guard the eggs, but once hatched no more care is given. May live to 5 years. In some areas, collection for the pet trade has been an issue. Skinks are vulnerable to changes in their local habitats, for example the removal of woody debris or rocks. In the Georgian Bay area, cover rocks (flat, relatively thin, mid sized rocks) are valuable real estate for a skink. Try to leave these types of rocks in place. Keep your cat indoors for the sake of skinks and other wildlife. Particularly on small islands, cats can eliminate a local population of skinks. Click here for more information on predation by domestic cats.